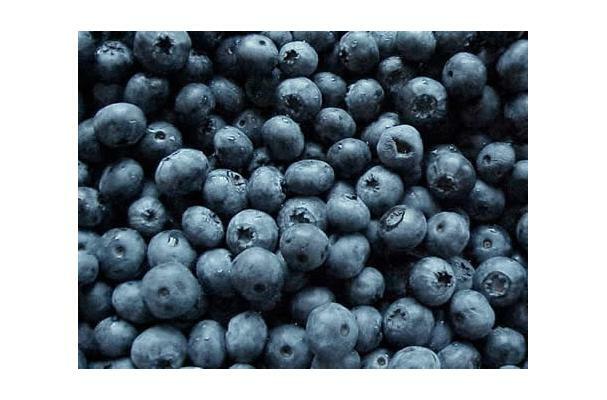 The Blueberry is a fruit which comes from a shrub belonging to the same family as cranberries and bilberries. Blueberries are highly nutritious providing a good soucre of dietary fiber, Vitamin C and E, and manganese and are one of the best fruits you can eat. They are flavorful and grow in clusters ranging in size from a pea to the size of a grape. Blueberries are available fresh, frozen or dried. They are popular fruits used with cereal, yogurt, pancakes, pies, muffins, smoothies and more. The fruit is a false berry 5–16 millimetres (0.20–0.63 in) diameter with a flared crown at the end; they are pale greenish at first, then reddish-purple, and finally blueish-purple when ripe.Blueberry bushes typically bear fruit in the middle of the growing season: fruiting times are affected by local conditions such as altitude and latitude, so the height of the crop can vary from May to August depending upon these conditions. Choosing: Blueberries must be ripe when purchased, as they do not continue to ripen after harvesting. Avoid soft, watery or moldy blueberries. Stained or leaking containers are an indication of fruit past its prime.so do not wash before refrigerating, and avoid those at your grocer's that are exposed to those mist sprayers used to keep greens fresh. Buying: Blueberries are sold fresh or processed as individually quick frozen (IQF) fruit, purée, juice, or dried or infused berries which in turn may be used in a variety of consumer goods such as jellies, jams, blueberry pies, muffins, snack foods, and cereals. Procuring: Blueberries may be cultivated, or they may be picked from semi-wild or wild bushes. In North America, the most common cultivated species is V. corymbosum, the Northern highbush blueberry. Hybrids of this with other Vaccinium species adapted to southern U.S. climates are known collectively as Southern highbush blueberries. Blueberry jam is made from blueberries, sugar, water, and fruit pectin. Premium blueberry jam, usually made from wild blueberries, is common in Maine, Ontario, Quebec, and British Columbia. Blueberries have a diverse range of micronutrients, with notably high levels (relative to respective Dietary Reference Intakes) of the essential dietary mineral manganese, vitamin B6, vitamin C, vitamin K and dietary fiber (table). One serving provides a relatively low glycemic load score of 4 out of 100 per day. Cleaning: Wash quickly under cold running water, preferably through a colander. Dry berries if not going to be eaten immediately. Significant production of highbush blueberries occurs in British Columbia, Maryland, Michigan, New Jersey, North Carolina, and Washington. The production of southern highbush varieties in California is rapidly increasing, as varieties originating from the University of Florida and North Carolina State University have been introduced. Southern highbush berries are now also cultivated in the Mediterranean regions of Europe, Southern Hemisphere countries and China. History: The genus Vaccinium, which contain around 20 different species, is native to North America, Europe and Asia.